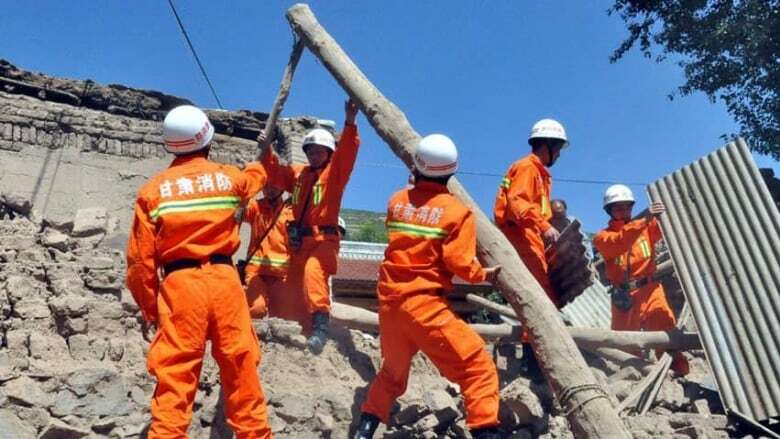 Rescuers with shovels and sniffer dogs chipped away at collapsed hillsides Tuesday as the death toll rose to 94 from a strong earthquake in a farming region of northwest China. Just one person was listed as missing and 1,001 as injured in Monday morning's quake near the city of Dingxi in Gansu province. About 123,000 people were affected by the quake, with 31,600 moved to temporary shelters, the provincial earthquake administration said on its website. Almost 2,000 homes were completely destroyed, and about 22,500 damaged, the administration said. The quake toppled brick walls and telephone lines, shattered mud-and-tile-roofed houses and sent cascades of dirt and rock down hillsides, blocking roads and slowing rescue efforts by crews trying to reach remote areas. Hospitals set up aid stations in parking lots to accommodate the injured, while hundreds of paramilitary People's Armed Police fanned out to search for victims in the region of terraced farmland where the quake struck about 1,200 kilometres west of Beijing. Min county in Dingxi's rural south accounted for almost all the deaths and the worst damage. Urban areas where buildings are more solid were spared major damage, unlike the traditional mud and brick homes in the countryside. Tremors were felt in the provincial capital of Lanzhou 177 kilometres north, and as far away as Xi'an, 400 kilometres to the east. The government's earthquake monitoring centre said the quake had a magnitude of 6.6, while the U.S. Geological Survey said it was 5.9. Measurements can often vary, especially if different monitoring equipment is used. The Chinese Red Cross said it was shipping 200 tents, 1,000 sets of household items, and 2,000 jackets to the area. Other supplies were being shipped in by the army and paramilitary police, which dispatched around 6,000 personnel and two helicopters to aid in rescue efforts. But heavy rain is expected later in the week, raising the need for shelter and increasing the chance of further landslides. Gansu, with a population of 26 million, is one of China's more lightly populated provinces, although the New Jersey-sized area of Dingxi has a greater concentration of farms in rolling hills terraced for crops and fruit trees. Dingxi has a population of about 2.7 million. China's worst earthquake in recent years was a 7.9-magnitude temblor that struck the southwestern province of Sichuan in 2008, leaving 90,000 people dead or missing.